Canada comes of age in the anguish of World War II, with soldiers on the beaches at Dieppe and women in the industrial work force back home. The country's military role, and the domestic, social and political consequences of the war are traced through poignant stories of Canadians on both sides of the Atlantic. The horrific global conflict steals the innocence of a generation... but brings hope for a new future. 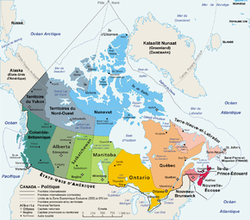 The Atlas of Canada - produced by the Canadian government. Provides numerous topographical maps including population distribution and resource distribution. maps including maps on traditional trading routes. maps, text and images to trace the development of Canada. Discover Canada - a backgrounder on regions in Canada written for new Canadians. The Canadian Encyclopedia--Good source for the history of Canadian political parties. Vote Compass (CBC) A tool to show you which party platforms are closest to your own views. Canada Votes (CBC News)--a collection of links, video news stories and news articles about the upcoming election. Includes interviews with each of the party leaders.